Title : Quack! Written in the International Language of Ducks! 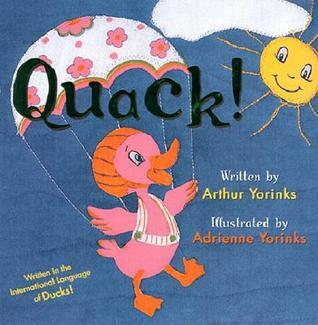 Told in the International Language of Ducks, this is a simple story about a duck who rides a rocket to the moon, misses his friends, and parachutes back home. I usually show the cover and ask the children what do they think it is about. I read it with lots of expression and acting out (hold fingers up for count down, leaps and sink down for parachute scene), and the children usually join in. At the end of each part I ask the children what they think is going on. Talking about a story like this is a great way to build narrative skills. I pair this with Ivan Bates' "Five Little Ducks" or Eva Moore's "Lucky Ducklings" for a quacking up storytime. I also like to throw in this Dr. Seuss tongue twister from "Oh, Say Can You Say? ":We have two ducks.One Blue. One Black.And when our blue duck goes "Quack-Quack"Our black duck quickly quack-quacks back.The quacks Blue quacks make her quite a quacker,But Black is a quicker quacker- backer.